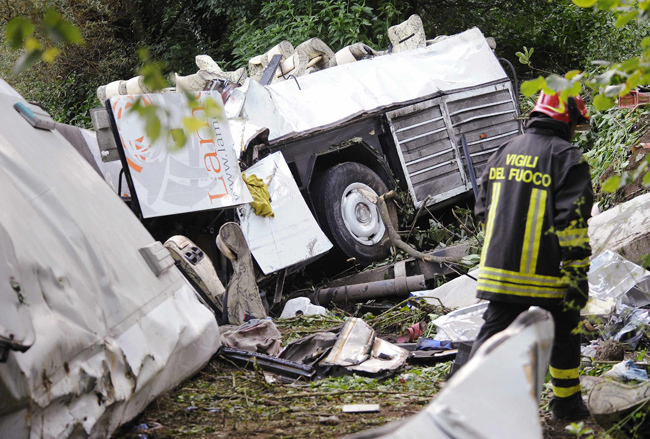 VATICAN CITY (CNS) — At least 38 pilgrims were killed on their way home from the Padre Pio shrine when their bus plunged off an elevated highway. Another 19 people were reported seriously injured, including passengers of nearby vehicles. Only 11 people were pulled alive from the wreckage, Vatican Radio and other news outlets reported. In a telegram, Pope Francis expressed his condolences and said his prayers were with everyone affected by the tragedy. He prayed those injured would recover soon and those in mourning would find some comfort through God. 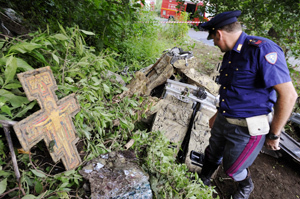 The accident occurred along a major highway in Irpinia, a mountainous region in Campania, in southern Italy, July 28. A number of the victims were children. A tour bus of about 50 pilgrims was heading back to Naples after a three-day pilgrimage to Catholic shrines, including Pietralcina, birthplace of Padre Pio. The bus driver lost control, skidded along concrete barriers until it broke through a guardrail and plunged 100 feet off the highway. While the cause of the accident was still unknown July 29, officials said a piece of the bus’s transmission was found less than a mile from the crash site, suggesting the vehicle was damaged in some way. Police on the scene also hypothesized that the driver had veered too sharply in an effort to avoid crashing into cars in front of the bus. However, one surviving passenger said a tire on the left side of the bus had blown, causing the vehicle to swerve out of control. The funerals for all 38 victims were to be held July 30 in the town of Pozzuoli. Bishop Gennaro Pascarella of Pozzuoli blessed the deceased when he visited the elementary school gym of Monteforte Irpino, where their remains were waiting to be taken home.